I don’t want to blow my own trumpet but I fear that’s exactly how I am going to come across here though that’s only cause this Goan Chicken Vindaloo recipe is that good. The issue I have with most recipes online is that they are not real.Some are just fancied versions of a normal chicken curry and if I am putting in so much effort to create something different I want an authentic recipe and this is exactly that.This is The Goan Chicken Vindaloo recipe you were searching for! To start with let me first answer the question on what is Vindaloo and how is it different from other Indian Curries. There are lots of fables surrounding Goan Chicken Vindaloo.This curry is has emerged from melting pot of poturgese,Goan and British influences. In fact,the name “Vindaloo” is actually a garbled version of the Portuguese dish called carne de vinha d’alhos which translates to “meat in garlic wine marinade”.In around 1800’s,this dish was Indianised by using palm vinegar instead of wine and was traditionally made with pork or beef.The further evolution of this dish happened when British ruled India- in that version the meat was marinated overnight with vinegar, ginger,garlic and spices and then cooked the next day. When made right a vindaloo curry should be red-maroonish in color,slightly sweet,have layers of heat from- red dry chillies, green chillies and black pepper and the most important have two distinct sour notes coming from the vinegar and the tamarind. Goan Chicken Vindaloo pairs the best with plain white rice.The plain rice really lets the palate experience the full flavours of a Vindaloo but in a pinch I also like it with crisp Parathas. Originally the vindaloo is made with pork but chicken is easier to cook with and also easier to find, atleast in India.This recipe would also work with mutton.To get the right texture and avoid labouring on the stove for too long-pressure cook the mutton before adding to this gravy. A vegetarian version of Vindaloo will be a curry made with par boiled potatoes or brinjal or even paneer.While making a vegetarian version of this dish-do keep in mind the cooking times.Almost all vegetables only need to be cooked for less than a couple minutes unlike a protein like chicken. Use medium sized pieces for any curry.It’s debatable whether chicken should be washed or not and I will leave that upto you. I also have some really good prawn recipes- Do try the Mangalorean Prawn Curry & Kerala Prawn Curry. 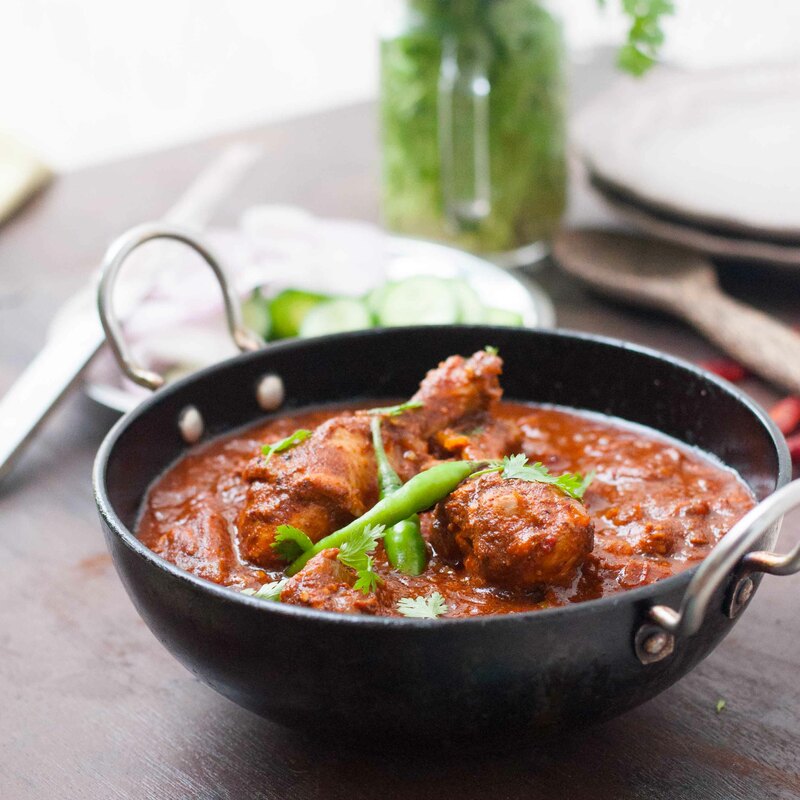 Authentic Goan Chicken Vindaloo cooked with Tamarind,Vinegar & Jaggery.This spicy Goan Curry is a favourite Indian preparation which dates back to eighteen hundreds. 1 tbsp dry tamarind- washed and soaked in 1/4 cup hot water. Heat the 1 tsp oil in a pan.Add the ginger and garlic. Saute till they start softening and browning just a little. To that add the black pepper, mustard seeds,cumin,coriander seeds,fenugreek seeds,cloves,cinnamon stick and Kashmiri Chillies and roast on low flame. In about 5 minutes, the coriander seeds will start to brown and the masalas will start to roast and smell. Turn off the heat.Let the masalas cool. Once cool, transfer to a blender along with vinegar, salt,turmeric and jaggery.Blend to a dry masalas.Add soaked Tamarind along with the water and blend again into a smooth paste. Marinade the chicken with this paste for at-least 15 minutes to 24 hours.Best to do this for 12 hours. Heat the 1 tbsp oil in a pan.Add the green chillies and onions. Cook till they are golden brown. Add the Chopped tomatoes, cook till they soften.Add the tomato puree and cook the gravy for another 2-3 minutes. Add 1 cup of water and cook on medium flame, covered for 25-30 minutes till the chicken is falling off the bone. Some more Fabulous Chicken Curries you have to make! I tried this recipe and it came out delicious. Thanks for sharing the recipe. The instructions were clear and easy to follow. Will definitely try other recipes. I am following your recipe it looks wonderful. I have a little feedback for you. Look over your recipe and instructions again. You have dropped out the tamarind water in the instructions. I can figure it out, but I have been cooking for many years. Thank you for sharing with the English speaking world! I will let you know what my English husband says! Thankyou Michele for pointing that out!! I have corrected my error!! Hi! I am doing a research on Indian cuisine. There have been different recipes for chicken vindaloo , mainly without Tarmarind. I am unfamiliar with the Goan culture. Could you please tell me if this is how Goans cook it at their homes?